Clara, with her youngest daughter Melanie, and two sisters-in-law, making skirts. Visiting families living in poverty is not easy. Often I fight back emotion throughout the visit, overcome by the difficult circumstances in which the family is living, then leave with a heavy heart, resigned to the unfairness of their situation. Todd, Anna and Logan riding in the truck. But the visit to a home in the little mountainous community of Cantón Paxot II in Guatemala was unlike any I’ve experienced. Our adventure began in the back of a pickup truck, much to the delight of the two teens in our group. We traveled bumpy backroads in the truck, the got out and climbed a narrow, steep dirt path to Santiago and Clara’s home. There we were greeted warmly by the family, which had covered the courtyard floor with fresh pine needles to welcome us. This is a custom usually reserved for celebrations, and the scent was wonderful. As we visited with the family, asking about their lives on the mountainside and sharing about our own lives as well, it became clear that this was a strong family, united in faith and love. They were happy to share their lives with us, and wanted to learn about us, too. Santiago works as a day laborer, while his wife, two sisters and mother sew and embroider skirts to be sold at the market. Walking up the path to the family’s home. Clara showed us her kitchen, complete with wood-burning stove and corn boiling in a large pot for making corn tortillas and tamales. The family also has a water filter provided by Compassion and water from a faucet. Their three daughters, Shirley, 7, Ashely, 5, and Melanie, 3, were quiet and shy throughout most of the visit. Because they are Mayan, the children haven’t learned Spanish well, yet, and speak Kiche instead, so our questions to them were translated from English to Spanish by our translator, then from Spanish to Kiche by their parents. We were told the younger children in the community could only speak Kiche. 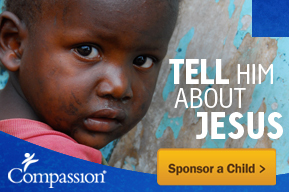 Shirley and Ashley are both in Compassion’s sponsorship program, which often indicates special need by the family, as Compassion usually registers only one child per family. Shirley excitedly showed us the letter she has received from her sponsor. Ashley hadn’t received any letters, yet. Santiago at right, with two of his daughters, his wife Clara, center, and two sisters at left. Shirley’s parents proudly presented her report card to us as well. She is excelling in math and a subject called “citizen education,” and she told us she likes school. During the visit, the women taught Todd and his daughter, Anna, to sew, and seemed pleased with their efforts. After we presented the family with a gift of grocery items, and posed for group photos, it was time to say goodbye, and Santiago extended an invitation to us to visit again anytime. Shirley with her report card. Clara with her daughters, Shirley and Ashley, in the kitchen. Clara and her daughters open the gift we brought for them. Delmi and her mother, Adela, share with us a photo of Roberto, Delmi’s father, who died in an accident less than two years ago. The devastating loss of a husband, a father of four beautiful daughters… it happened almost two years ago. The date was Sept. 9, 2013, and it was the same day Compassion project GU-492 opened in San Martín Jilotepeque, Guatemala. It was a day that would change the lives of 9-year-old Delmi and her family members forever. As our small group walked to visit Delmi’s home, project workers explained the family’s situation to us. They said Delmi’s mother, Adela, had a very difficult time after her husband’s death, including dealing with depression. They told us Adela continued to struggle, and that her daughter Delmi would receive more help when the project hired a new counselor. So we walked up the steep path to the family’s hilltop home, and we didn’t know what we would find there. The yellow-painted brick home sat on a hillside, overlooking the community. It felt fresh and clean on that hill, after walking the busy streets below. There were trees offering refreshing shade, a worn bench on a covered porch looking out over countless tin-roofed homes. Potted plants with flowers added color, while chickens wandered and pecked the ground beneath brightly colored clotheslines. It seemed to be a peaceful refuge. Delmi shows us her basketball medals. And there we met the family. Adela, the mother, introduced us to her daughters, Dulce, 15, Delmi and Fatima, 4. Her oldest daughter wasn’t home at the moment because she was studying for school, but we would meet her later in the visit. We also later met the girls’ abuela, Adela’s mother who lives nearby. We visited with the family while enjoying a special orange drink Adela had prepared for us. During that time, I saw a strong and courageous woman in front of us, a woman hurting deeply, possibly shattered by her loss, but forging ahead for her children. Adela supports her family by selling snacks at a nearby school. Her own mother does the same job. She spoke glowingly of her mother, whom she said taught her the value of hard work, raising her own family without a husband. Adela said she prays every day that her mother will never leave her because she doesn’t know how she will go on without her. She clearly receives a lot of support from this woman and loves her very much. Adela shared with us that she reads out of Psalms from her Bible every night; that she can’t go to sleep without reading it. She said it is difficult when her youngest daughter is upset and cries for her daddy; that it hurts her because she feels helpless. Delmi, who entered the Compassion program when it opened, showed us the medals she’s won playing basketball. She makes good grades in school and wants to earn a science degree. Adela’s hard-working example obviously is rubbing off on her daughters. And much too soon, it was time to say goodbye to this special family. We prayed with them, loved them, took photos together and said our goodbyes. And while there doesn’t seem to be a tidy, happy ending to wrap up this family’s story, there is reliance on God, love of family, and Compassion’s support, which is more than many hurting families have. Adela with three of her daughters. The view from Adela’s home. Our group with the family. If you are interested in sponsoring a child in Guatemala, or in any of the 27 countries around the world where Compassion works, please click here.